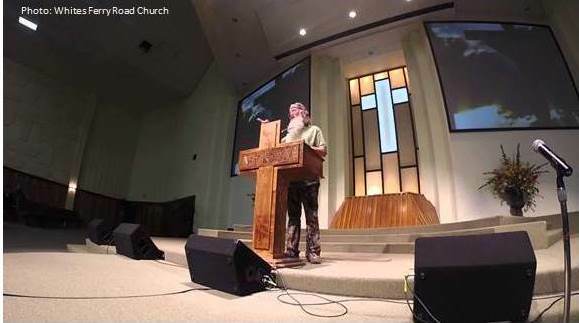 Phil Robertson’s Easter sermon witnessing for the Biblical definiation of marriage has gone viral after the video was released on YouTube. Calls from the radical homosexual lobby for Phil’s ouster from his popular TV show “Duck Dynasty” have begun again. We urge our liberty loving friends to stand with Phil and his right to religious liberty and freedom of speech. Robertson delivered the sermon to a wildly enthusiastic congregation at Whites Ferry Road Church. According to The New York Post when he was done preaching the “Duck Dynasty” patriarch got a tremendous round of applause and cheers. Speaking at the church in his hometown of West Monroe, La., Robertson told the congregation that he refuses to back down on his beliefs. “Neither the sexually immoral, nor the idolaters nor adulterers nor male prostitutes, nor homosexual offenders, nor thieves, nor greedy nor drunkards nor slanderers nor swindlers will inherit the kingdom of God,” preached Mr. Robertson. “What's Jesus coming back for?” asked Phil. “To bring salvation to those who are waiting for it. Are you waiting on Jesus? Or are you afraid to see that sky busting, you see him coming? You got two lists. I gave some guy one list. You say, were they mad at you about that list? They were mad at me." Censorship of Robertson's Christian witness is 100% wrong and violates his religious freedoms, we urge you to sign our petition and join us in standing with Phil Robertson. SIGN THE PETITION IN SUPPORT OF PHIL ROBERTSON'S FREEDOM OF SPEECH AND RELIGION. Click this link to receive the good news through Phil Robertson's witness for Christ at the White's Ferry Road Church. Submitted by ONTIME on Tue, 05/27/2014 - 14:53.